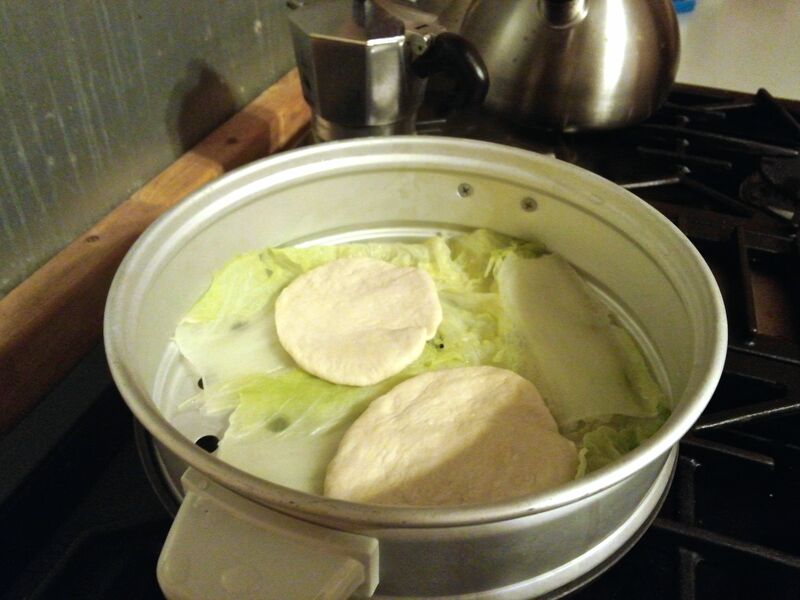 I’ve been working a lot lately, finishing up my research work for my Ph.D., and not finding time to post anything new and, instead, making many old favorites: fish tacos, fried rice, pizzas, and sandwiches. 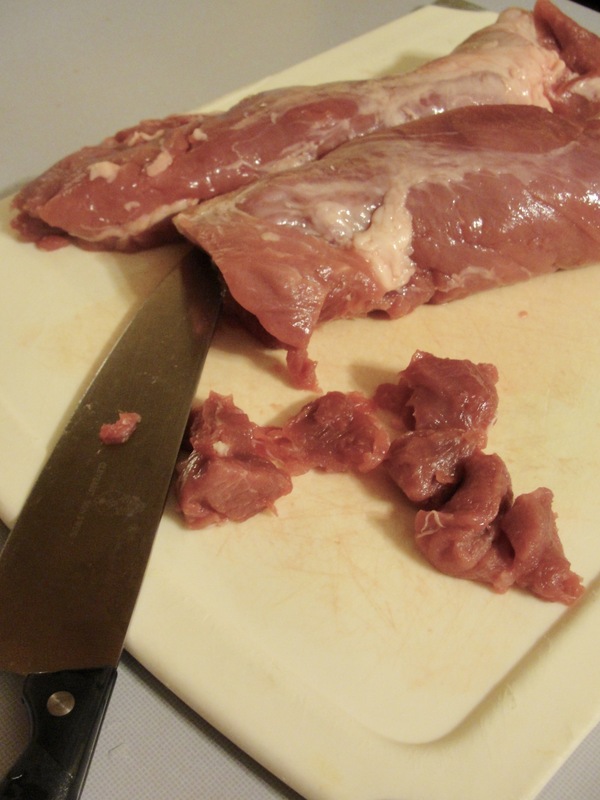 However, I have been experimenting with various cuts of pork, most recently pork shoulder that was a bargain, on sale for just $1 per pound. I originally bought and 8 pound bone-in pork shoulder roast, but I used about 60% of it to make carnitas for a group of friends. 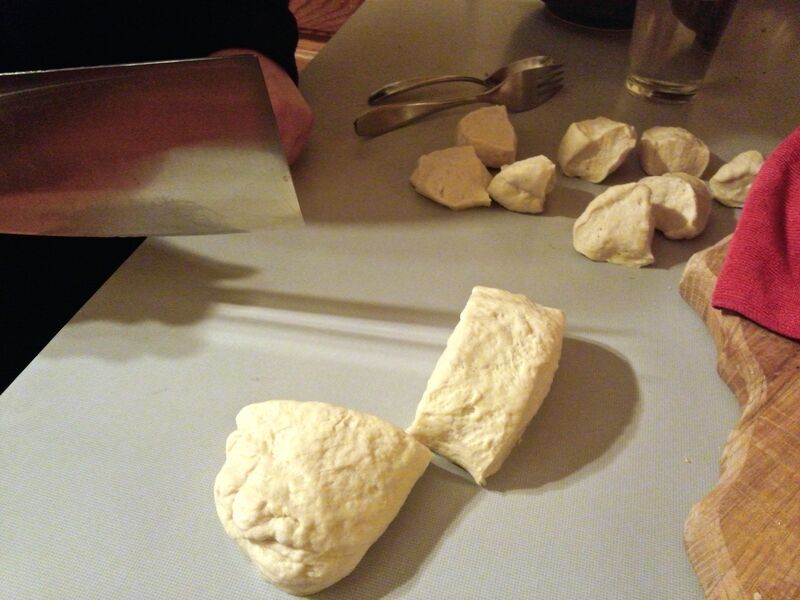 That left the rest, with the bone still in, for this recipe. 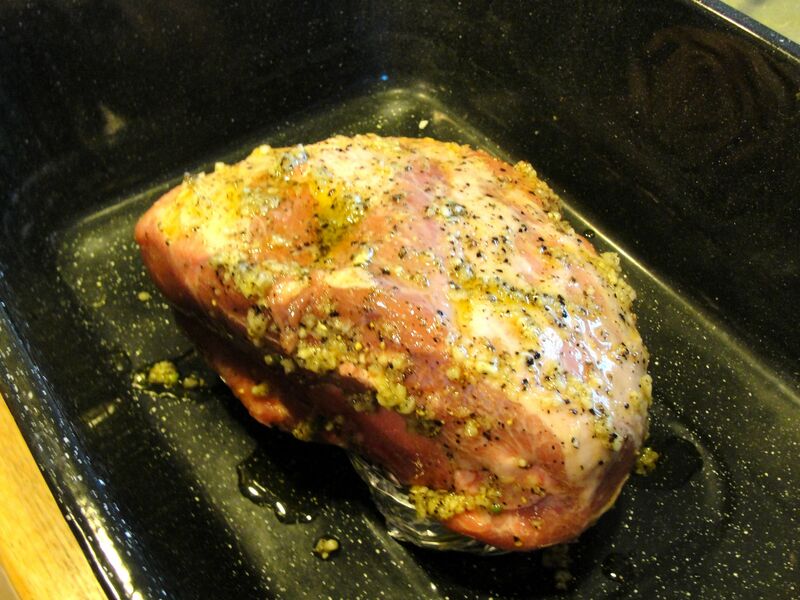 This is a really simple recipe; season the pork shoulder with just olive oil (~4 T.), fresh ground pepper (~1 T.), coarse salt (~1 1/2 t.), and minced garlic (8 cloves). 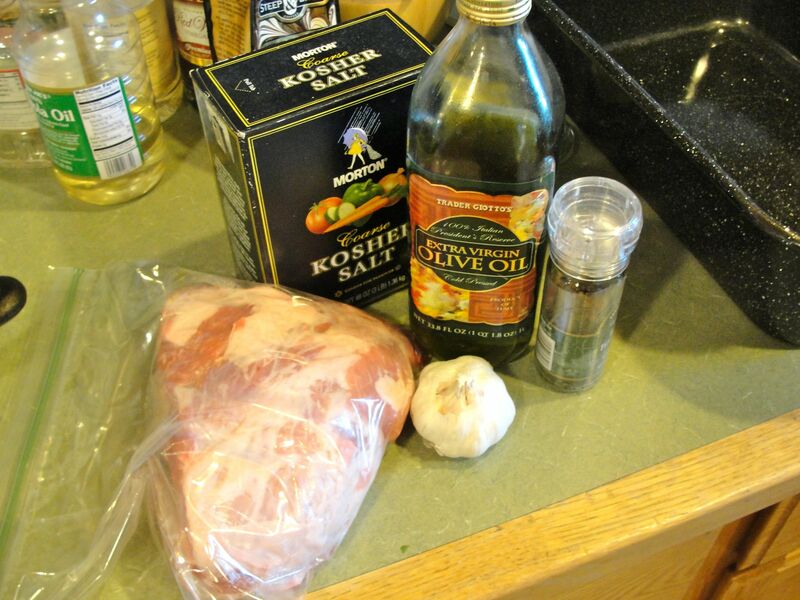 Mix those ingredients together in a bowl and slather it on all sides of the pork shoulder. Next, I used a trick I learned from Alton Brown’s Perfect Roast Turkey Recipe. 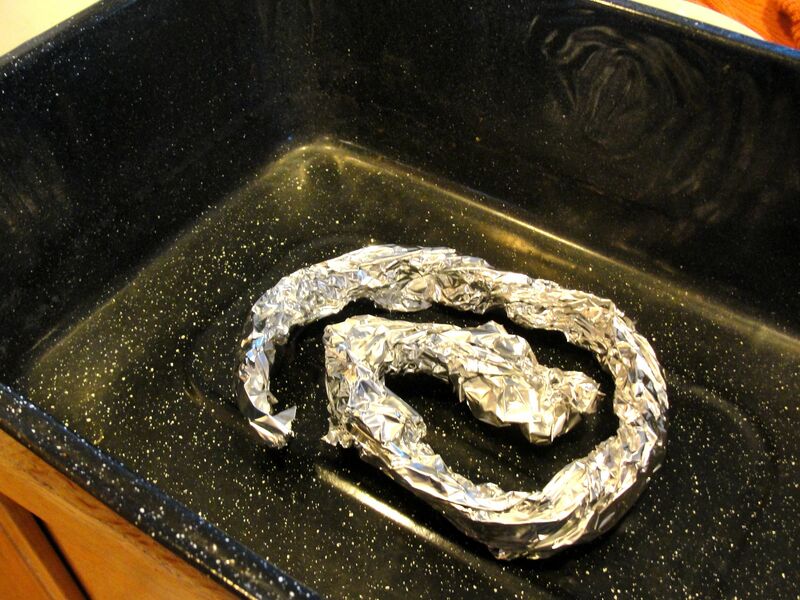 If you don’t have a suitable rack for a roasting pan, you can substitute a coil of crunched-up aluminum foil. 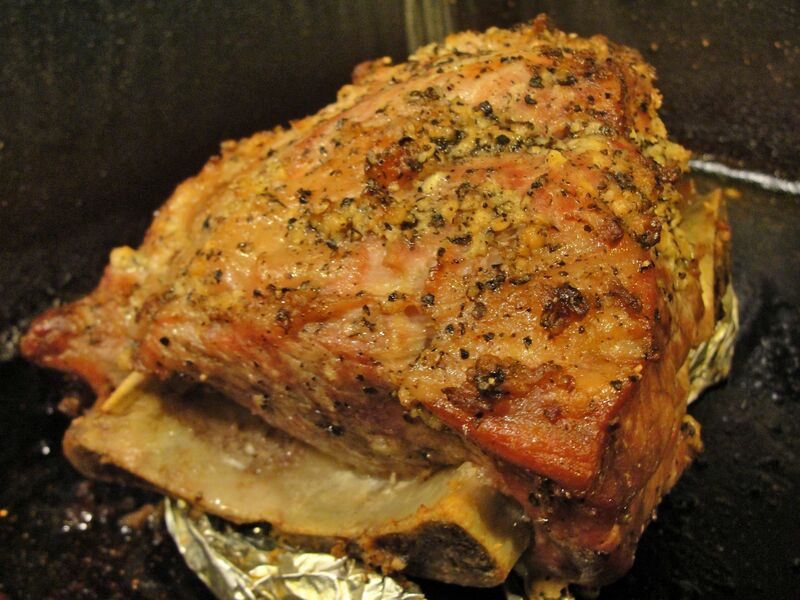 Place the seasoned pork atop that rack in a roasting pan, and place, uncovered, in a 425° F oven for 20 minutes. After that, cover the roasting pan, pour some water in the bottom to keep the fat drippings from burning to the bottom, and cook for approximately 2 hours at 325° F and check the temperature with a meat thermometer; remove it when it has reached 180° F.
This time (2 hours) was for an approx. 3 pound roast. 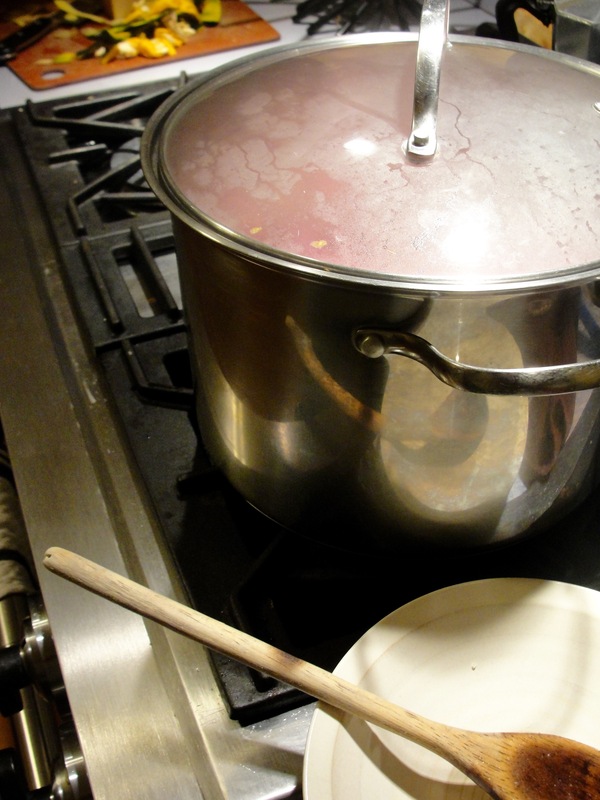 I found that mine was more than done in that time given that a thermometer read 195° F. I decided to cover it, even though some recipes don’t, since some follow-up comments in a recipe (linked below) said the garlic burned… mine didn’t. 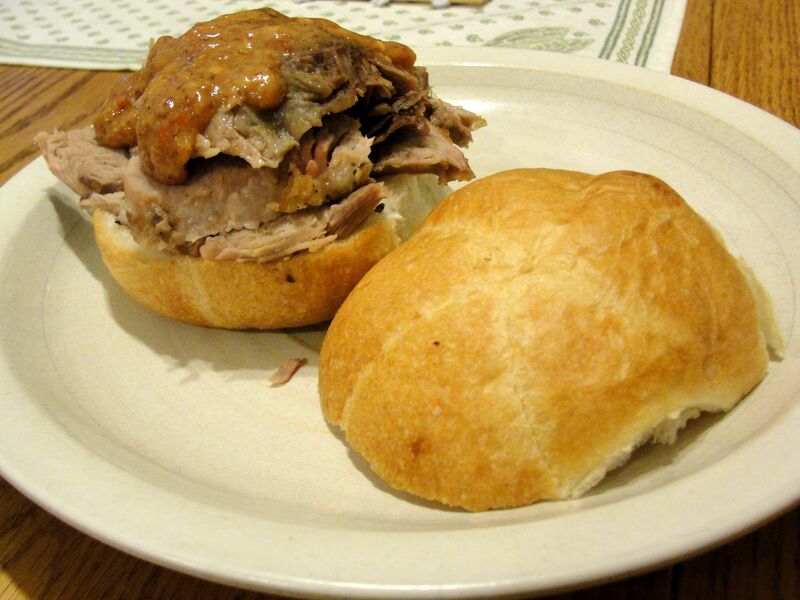 After letting it rest on a cutting board for about 15 minutes, I sliced it and served it on a kaiser roll and topped it with a simple spicy mustard BBQ sauce: a mix of Grey Poupon Country Dijon mustard with a bit of sweet BBQ sauce and some chili garlic sauce. Truth be told, I actually considered six or more other recipes, but they either required marinating or brining, or called for either a large pressure cooker or slow roaster, neither of which I have. First off, if you landed here expecting an approximation of the carnitas from Chipotle Mexican Grill restaurant, you’re in the wrong place. 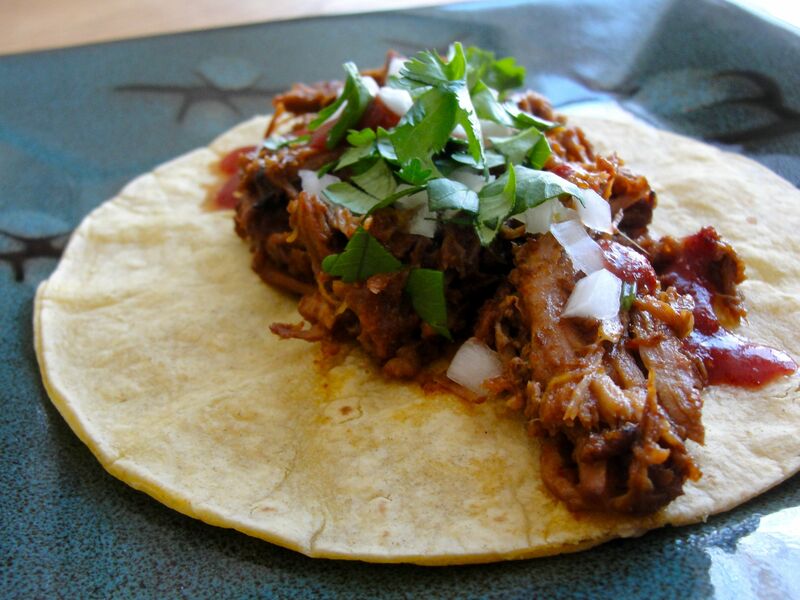 Instead, it’s my slight twist on traditonal carnitas, the mexican pulled-pork staple. 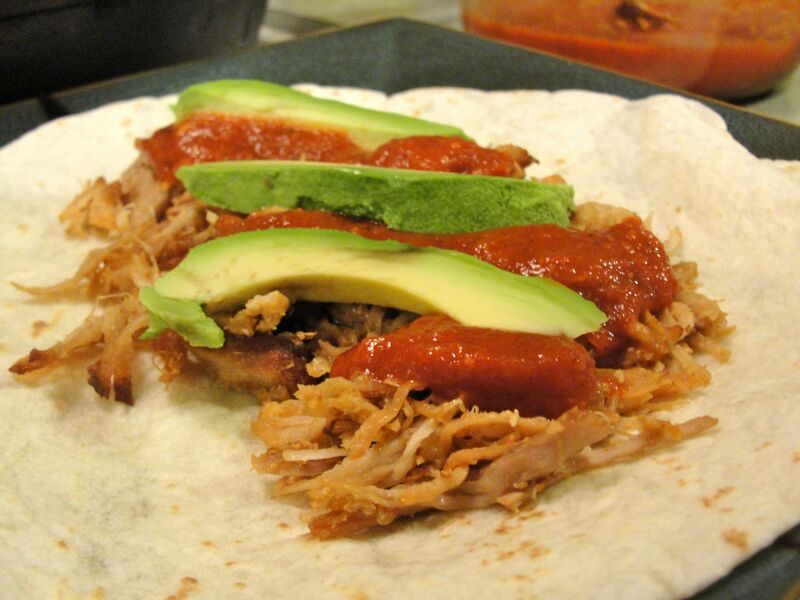 Carnitas is one of my favorite taco and burrito fillings, but I’d not made this delicious meat at home. 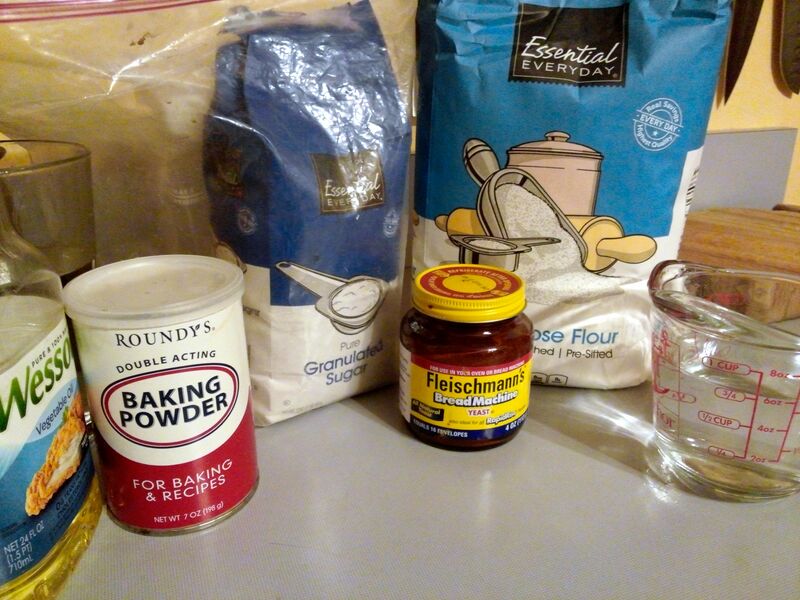 I decided to start with Rick Bayless’ recipe that employs a two-phase cooking method: first moist, then dry[ing]. 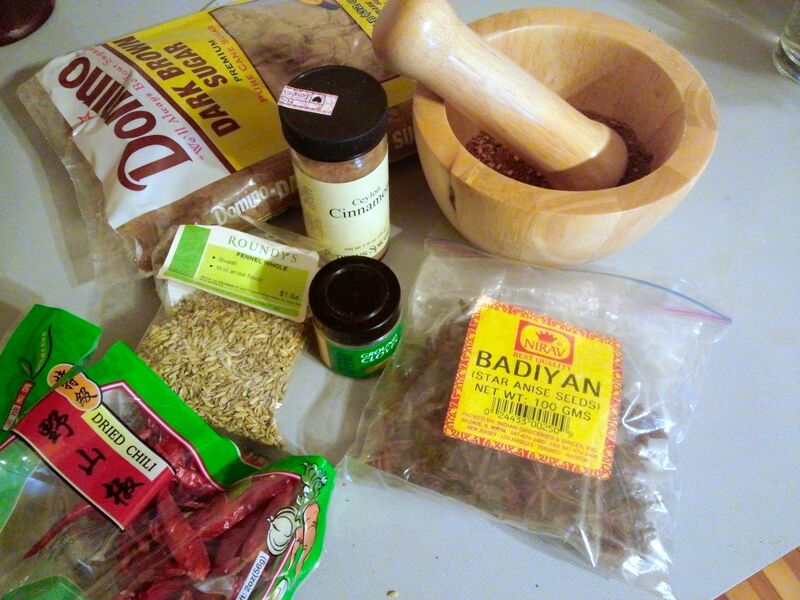 My variant uses chipotle peppers for flavor, rather than other spices or smoke flavoring. Truth be told, my newfound inspiration to actually make carnitas was that I found a lean 2 pound pork rib end roast in my freezer; I’d bought it some time ago on sale for less than $3 per pound. Also, I happened to have a broiler pan with rendered bacon fat from yesterday’s breakfast. Bacon fat is typically quite salty (compared to lard), but I had accidentally purchased low-sodium bacon, so I decided to experiment with using the bacon fat in place of salt and lard, or oil, that you typically find in carnitas recipes. 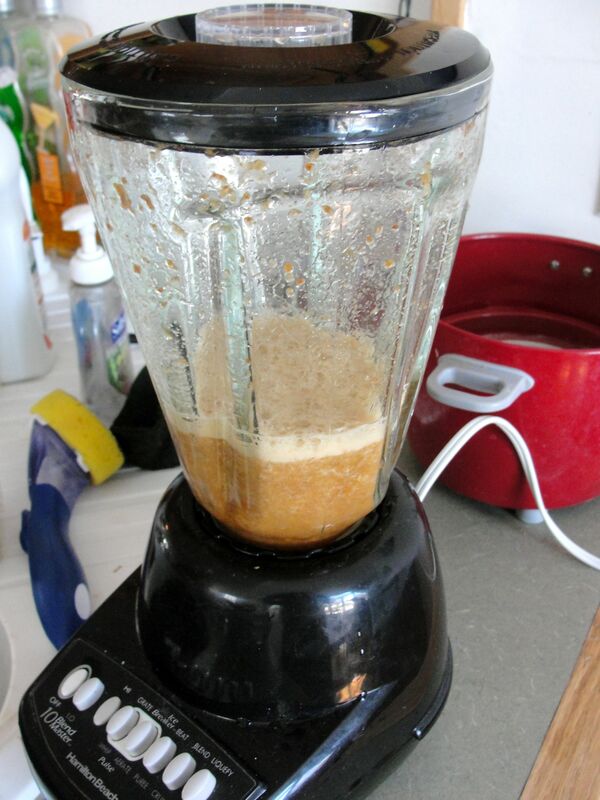 First, I soaked two large dried chipotle peppers, rinsed them, removed the veins, seeds, and stems, and then liquified them with some of the soaking water (~1 cup) in a blender. 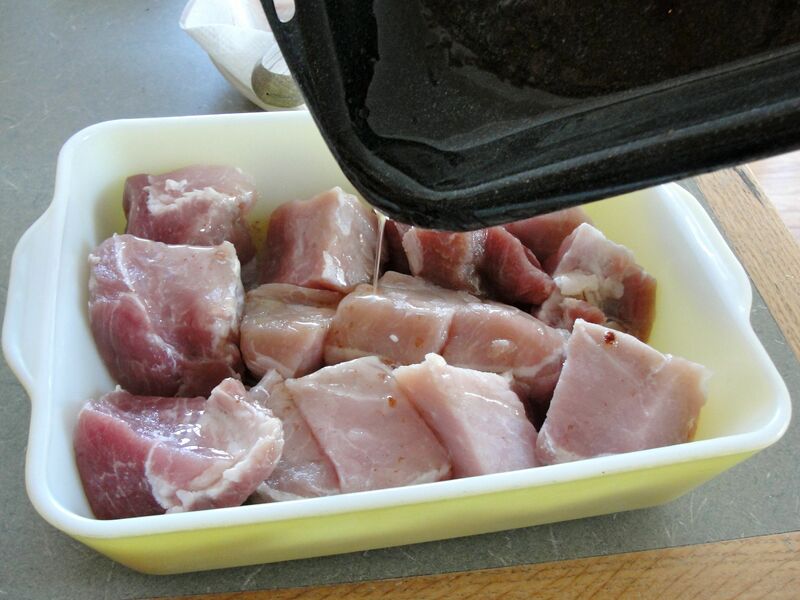 Next, I cut the pork into approximately 2″ cubes and placed them in a baking dish. Because the rib end roast was quite lean, I added the warm rendered pork fat (~1/3 cup) from cooking 1 pound of low-sodium bacon (left from yesterday’s breakfast). 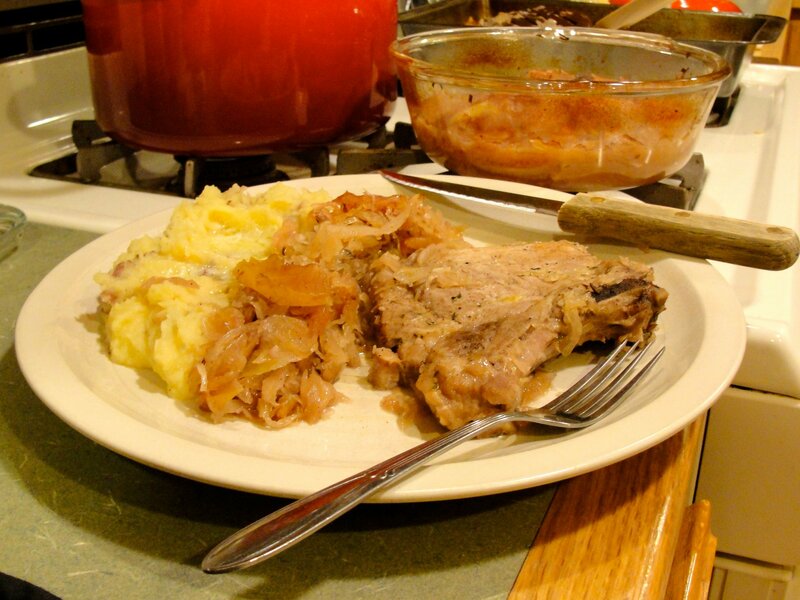 Boneless pork end rib roast, cubed and topped with rendered pork fat. 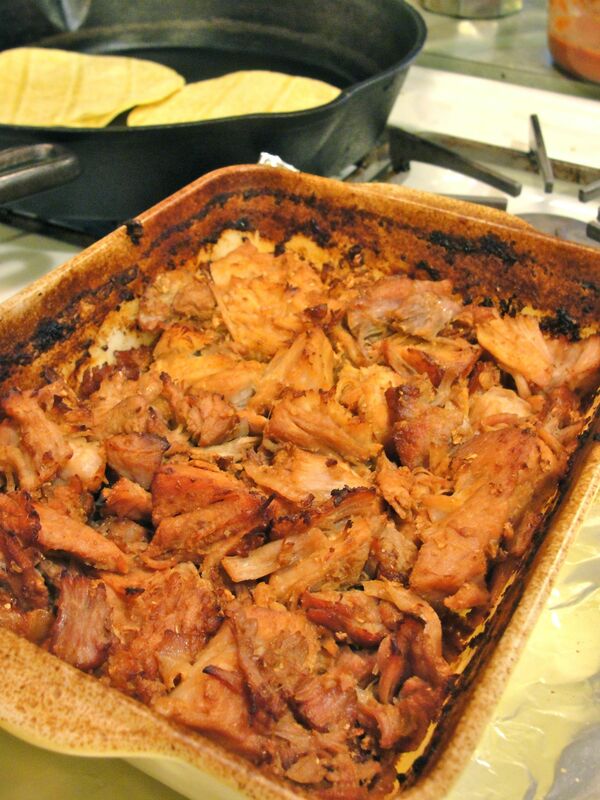 I poured the chipotle and water mixture over the pork, covered the dish, and put in a preheated 375° F oven for 1 hour. 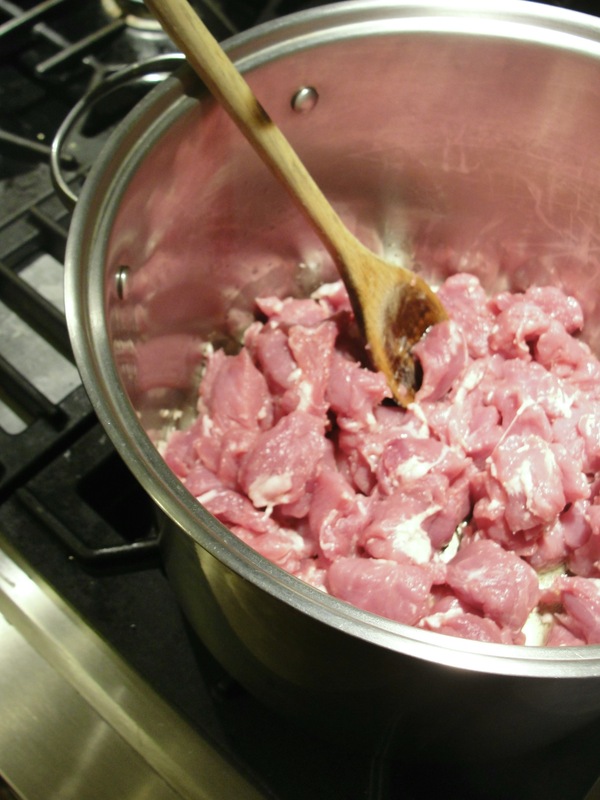 Cover the pork with fat, and water mixture, in a covered dish in preparation for moist cooking phase. After this, I uncovered the pork, placed the baking dish on a foil-covered pan (in case of spatter), and “dry cooked” until the water mostly evaporated, leaving just the rendered fat. 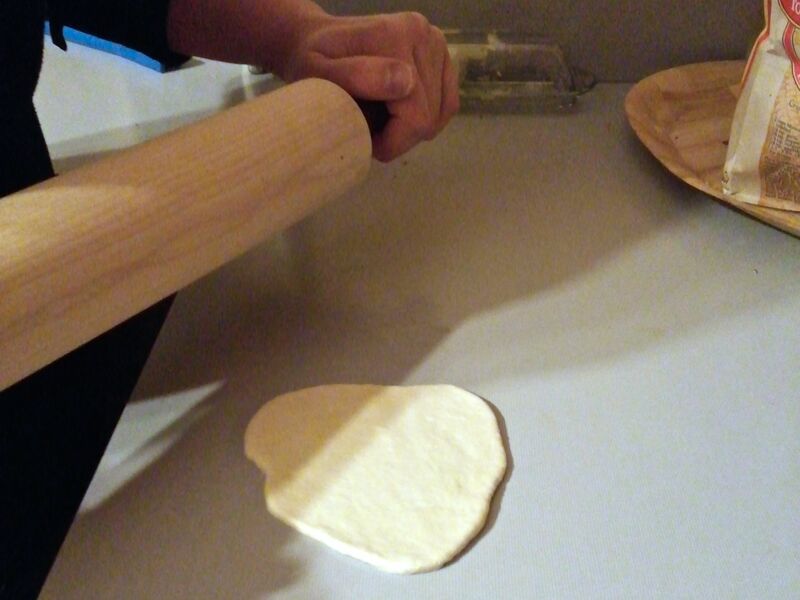 During this phase, be sure to turn the pieces regularly, e.g., progressively more frequently to every 7-15 minutes, both to keep the pieces moist and to prevent burning on top. Total cooking times was 2 hours 15 minutes: 1 hour moist cooking (covered) at 375° F and 1 hour 15 minutes dry cooking (uncovered, turning occassionally) at 450° F. Afterwards, I used two forks to pull the pork into small pieces. Finished carnitas, pulled into small pieces with two forks. 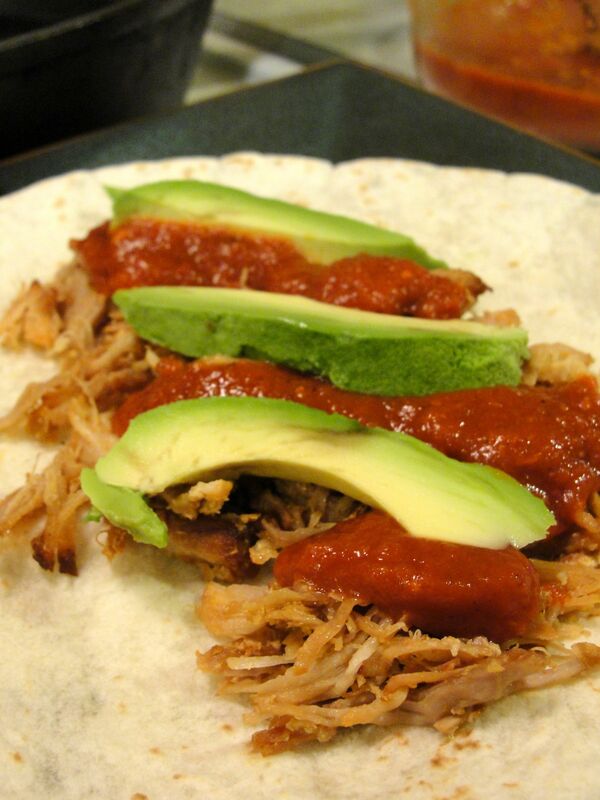 I served the carnitas in tacos, on warmed tortillas, topped with a homemade chipotle garlic salsa and slices of fresh, ripe avocado. This was a satisfying first effort at carnitas, having mild smokiness both from the bacon and from the chipotles. I’ll definitely make it again. 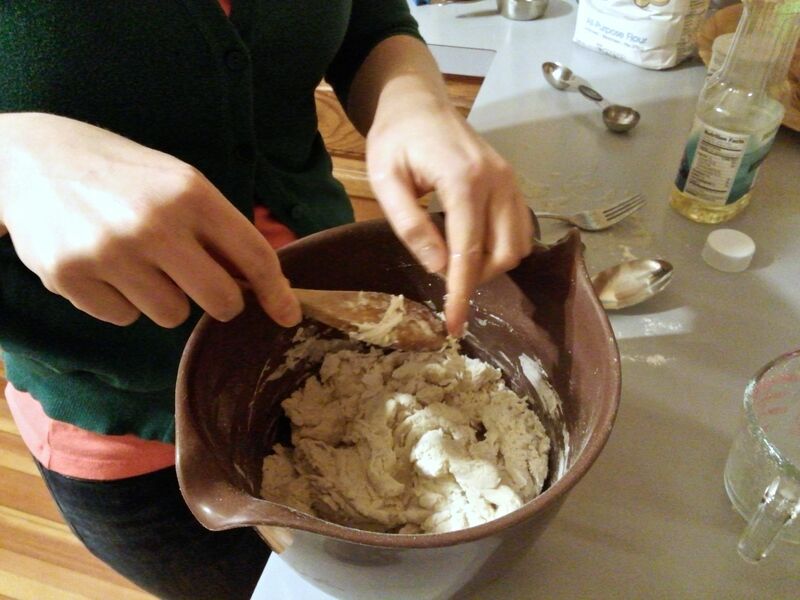 I’ll caution you about using bacon fat here, though… it definitely had a generous amount of salt, so don’t add any more. 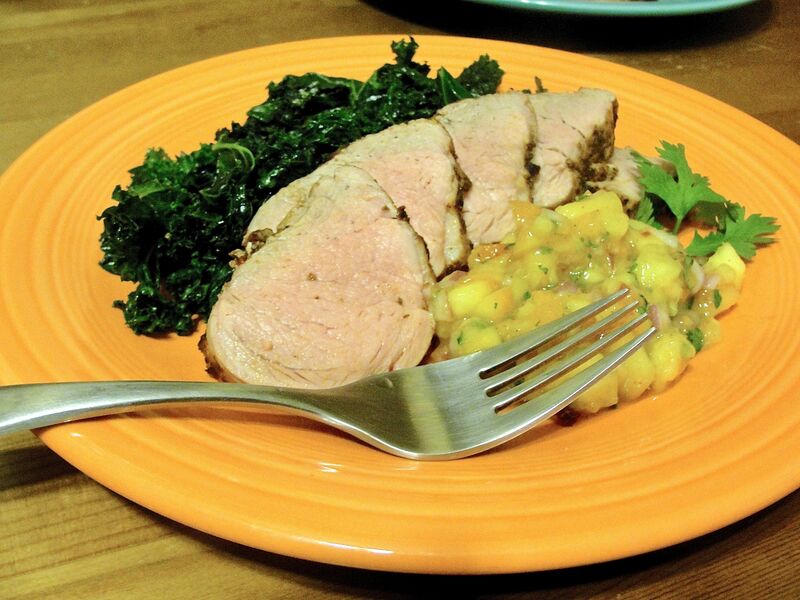 A less-lean cut of pork would be a better option, obviating the need for added fat to get the moist consistency that one expects from carnitas. I made this again, this time with pork shoulder roast ($1.99/lb. 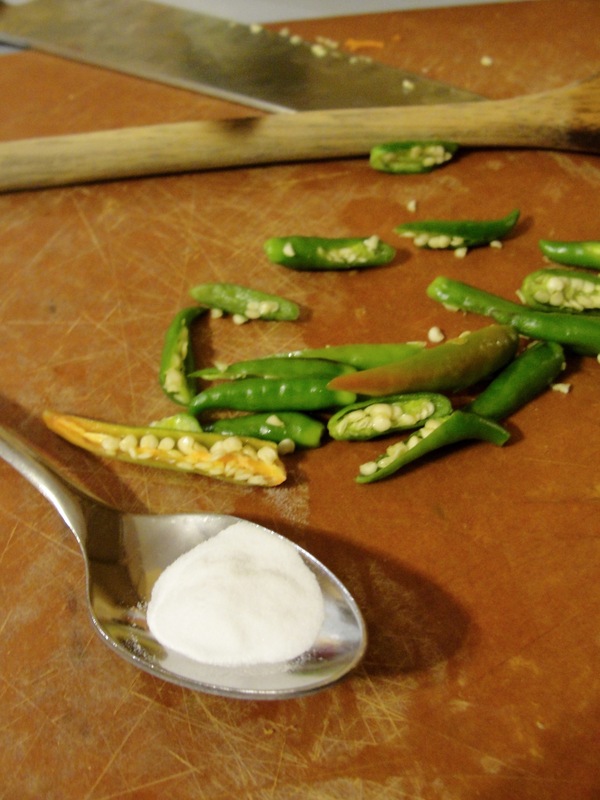 ), just its natural fat and a bit of salt, but with many more rehydrated chipotles and an ancho chile. This was great too, and less salty than the prior experiment with rendered bacon fat. Carnitas taco with white onion, cilantro, and hot sauce. I tried this same preparation with beef shoulder roast. Unfortunately, this isn’t a great technique for beef; it just wasn’t tender. Once cooked, I had to chop the meat into tiny pieces. 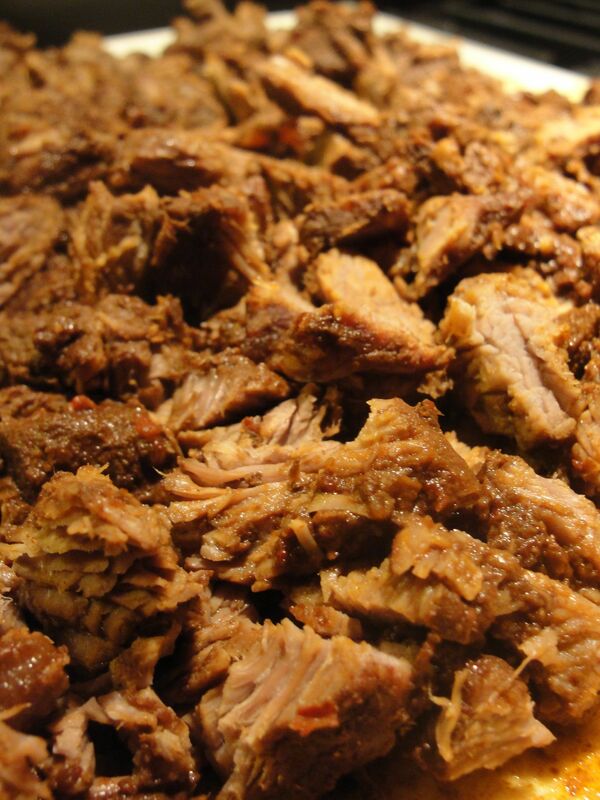 It tasted good, and is not unlike the texture of the finely chopped steak some mexican kitchens serve, but isn’t tender the way pot roast or barbacoa would be. For that, you’ll have to slow cook for longer time. 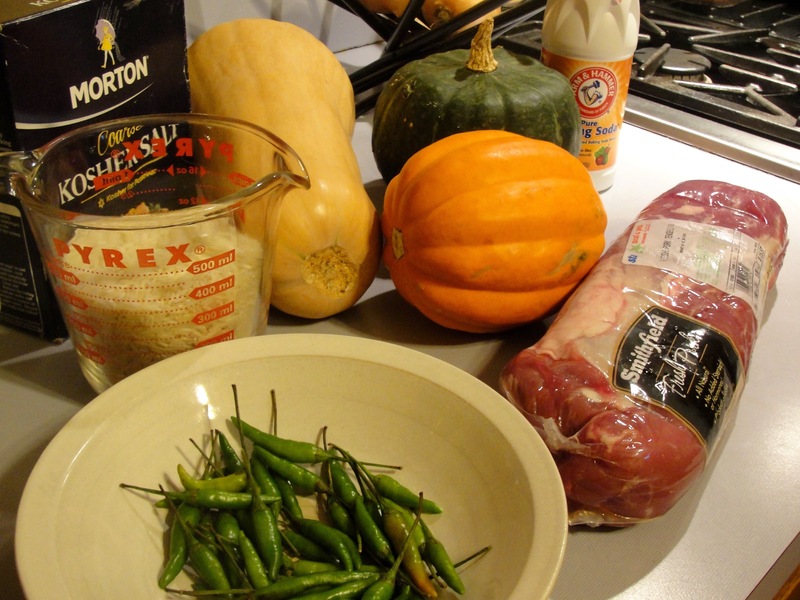 Beef shoulder roast prepared by this wet, then dry method; it’s not the same. I am happy to say I’ve just acquired a new vegetarian housemate. Oh, I was quite happy with my previous housemate/friend – also a vegetarian – but he moved back to India a couple weeks ago. 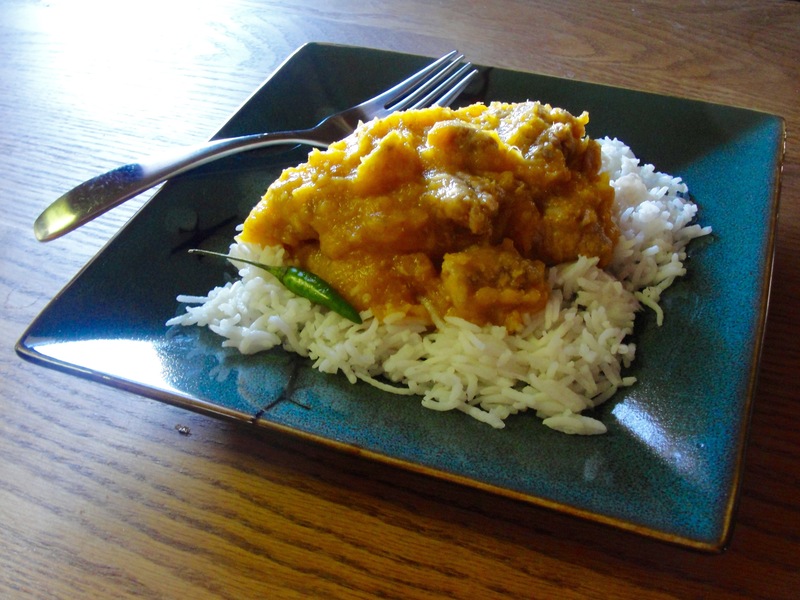 In hindsight, it’s obvious that I’d been focusing much more on vegetarian dishes in the blog in past months, in part due to the fact that I wanted to be able to share my meals. 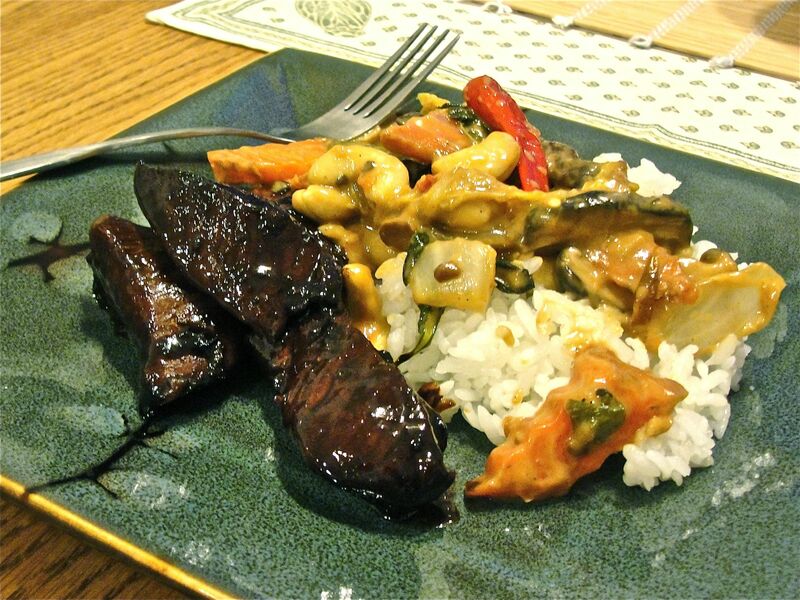 However, last night, I also had some carnivorous friends as dinner guests, so I made a “segregated” meal that it could be enjoyed by the carnivore or vegetarian: boneless asian-style ribs accpompanied by a thai-inspired spicy coconut curry with cashews and whole basil leaves. 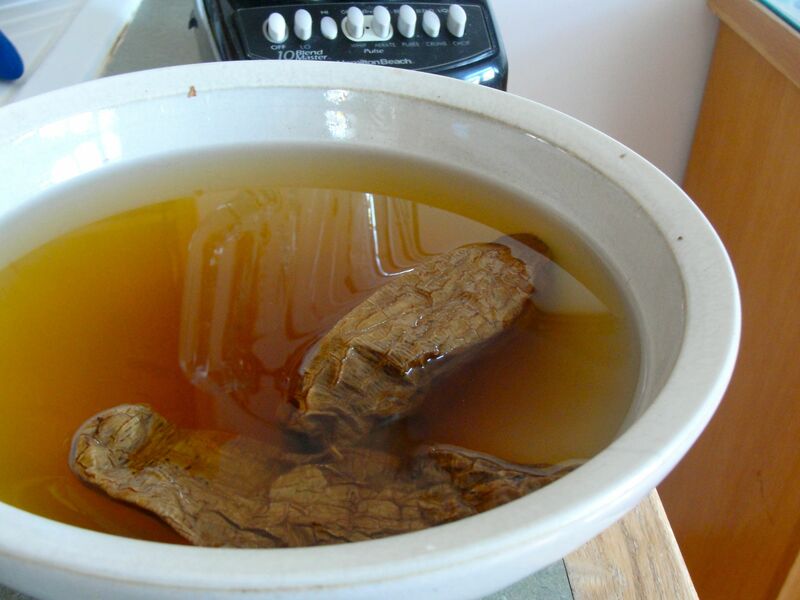 The ribs are similar to what might be served in American Chinese restaurants. They’re both convenient to make and to eat, because they bake for just a short time and are boneless. 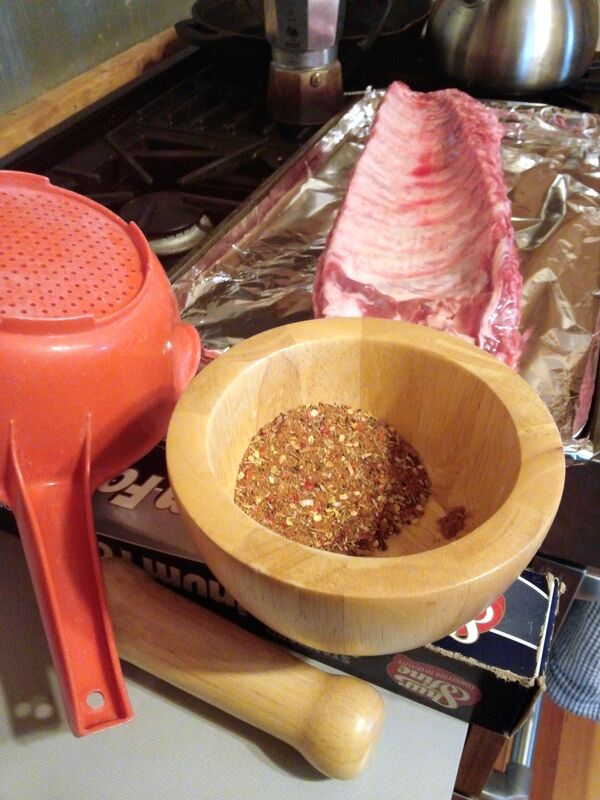 chili garlic sauce and/or Sriracha hot sauce (optional – I used both), ~1-2 T.
Directions: Prepare a marinade from these ingredients in a bowl large enough to also accommodate the rib pieces, and place the rib meat into the marinade, coating well. 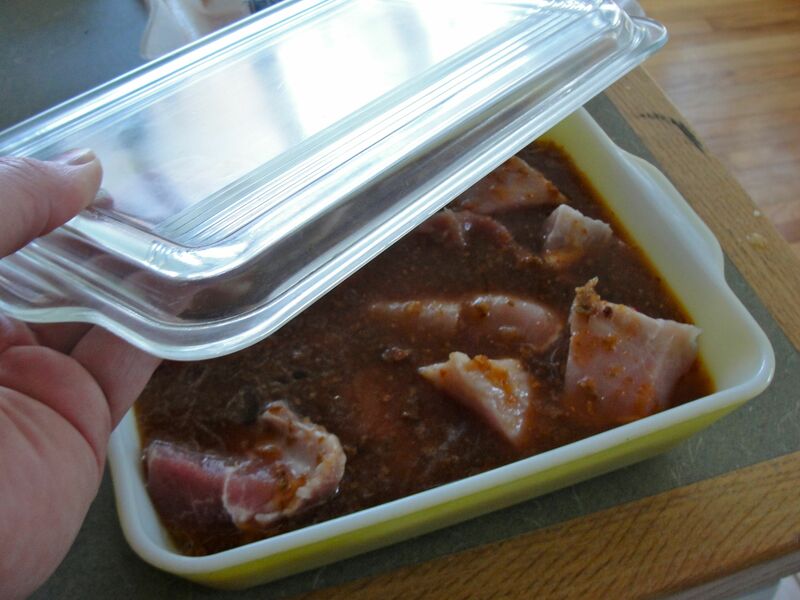 If time allows, optionally marinate for 4 hours (refrigerated), as I did here. 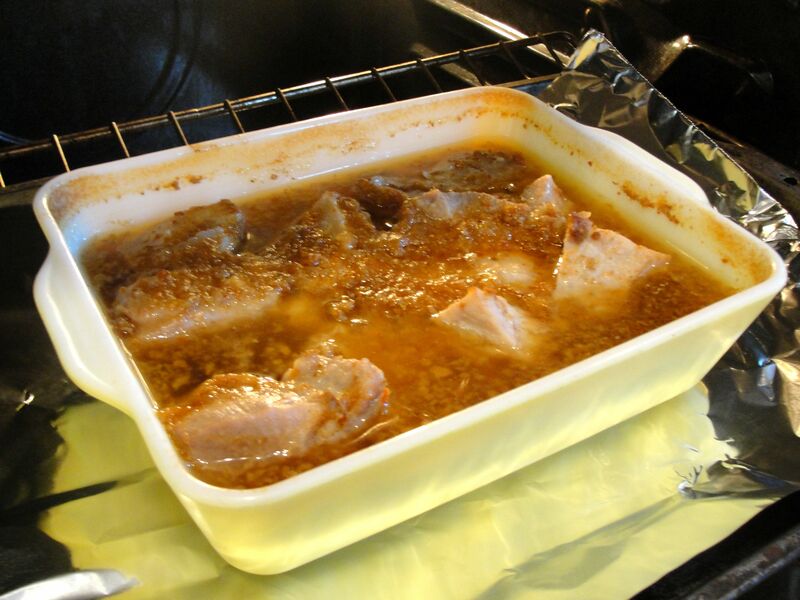 Lay the rib pieces out on a foil-lined jelly-roll pan or baking dish, and cover with remaining marinade. Cook 20-35 minutes in a 400° F oven, turning occassionally and covering again with marinade. 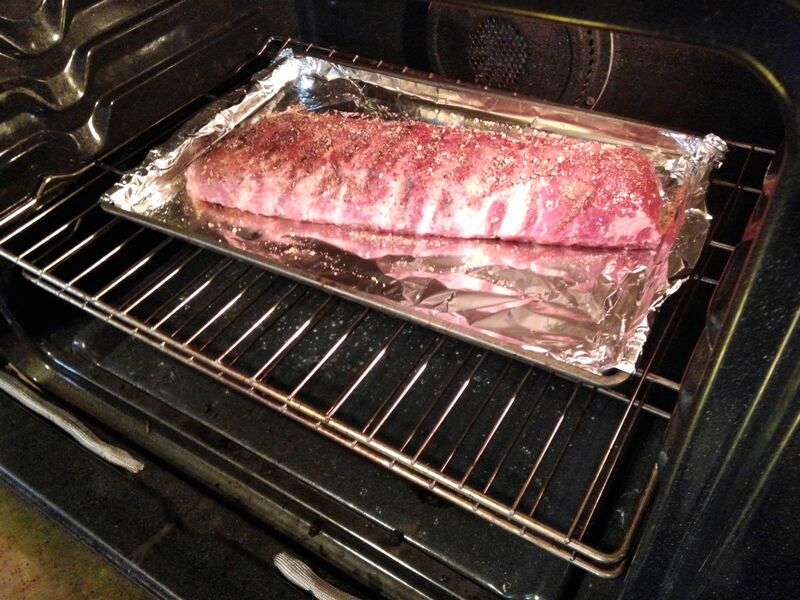 Time varies based on size of pieces and thickness; the ribs should reach 140° F internally. I baked the ribs pieces (~1 inch thick max.) for about 35 minutes total. 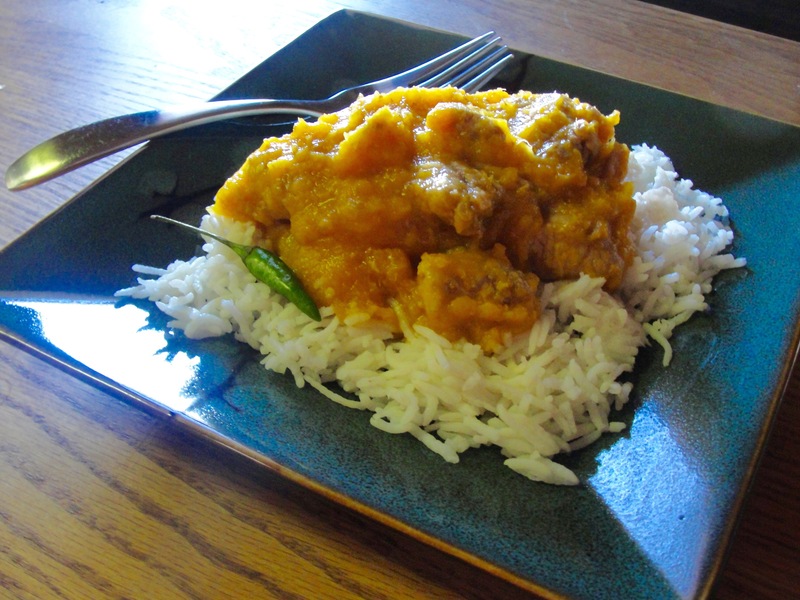 These sweet country ribs were delicious and a nice option to accompany a vegetable curry. 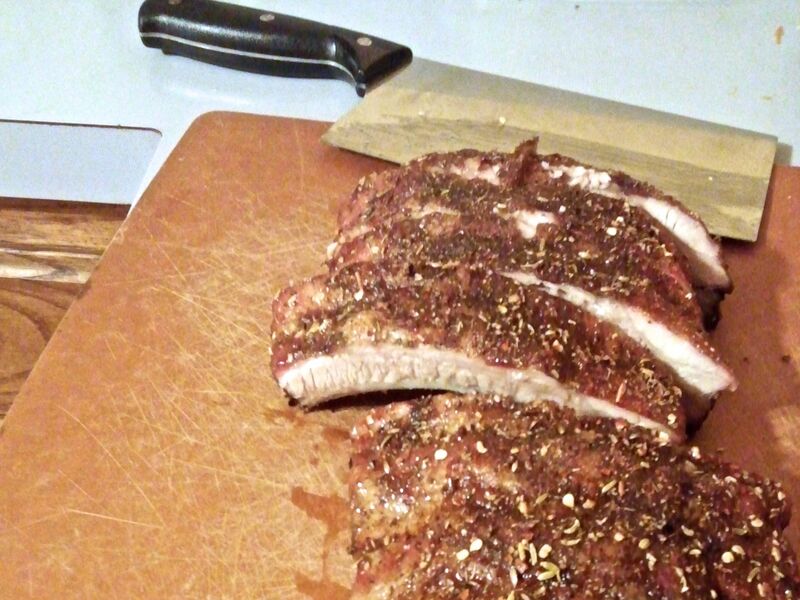 It might have been luck that the country ribs I bought were quite tender, since I baked them for so short a time, in contrast to the slow-cooker ribs recipes you often see. Szechuan Twice-Cooked Pork, a.k.a. 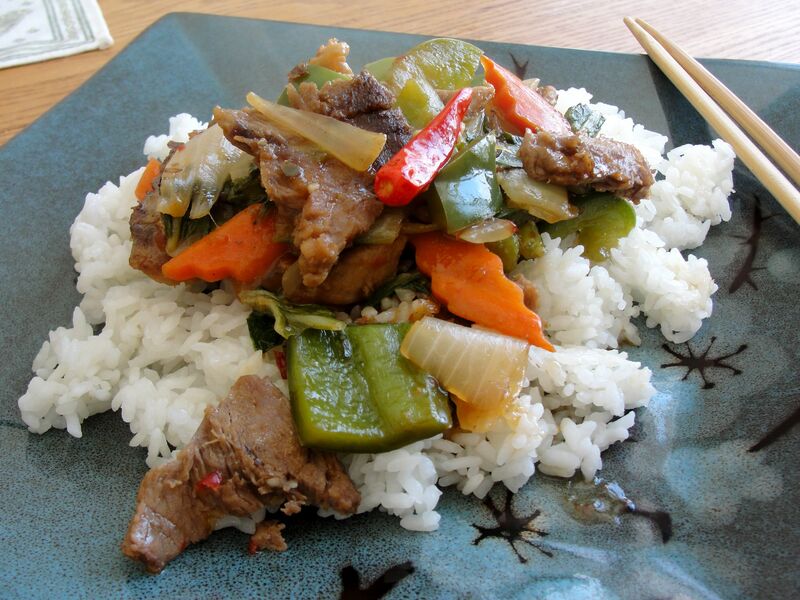 Double-Cooked Pork, is one of my favorites and thankfully available at most every Chinese restaurant where I live. 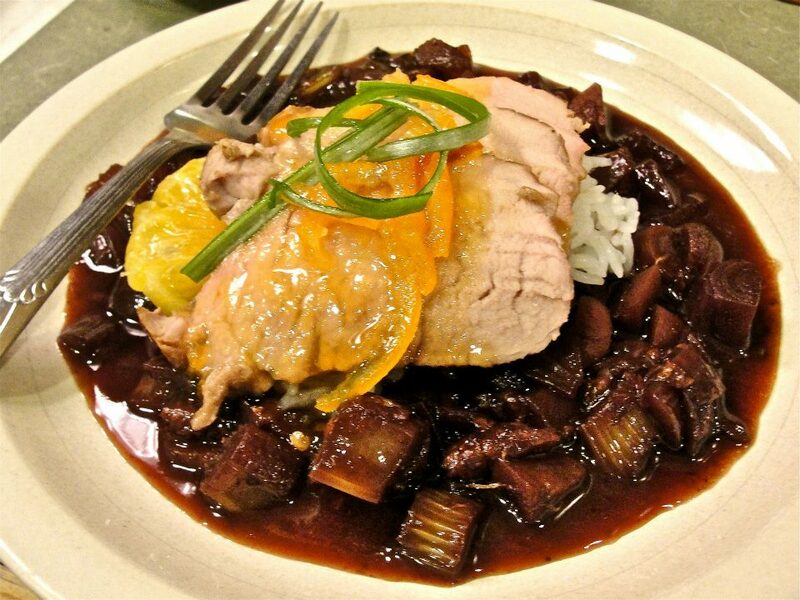 It almost always consists of sliced pork, cabbage, black mushroom, scallions, and a brown sauce that is a blend of sweet and spicy. 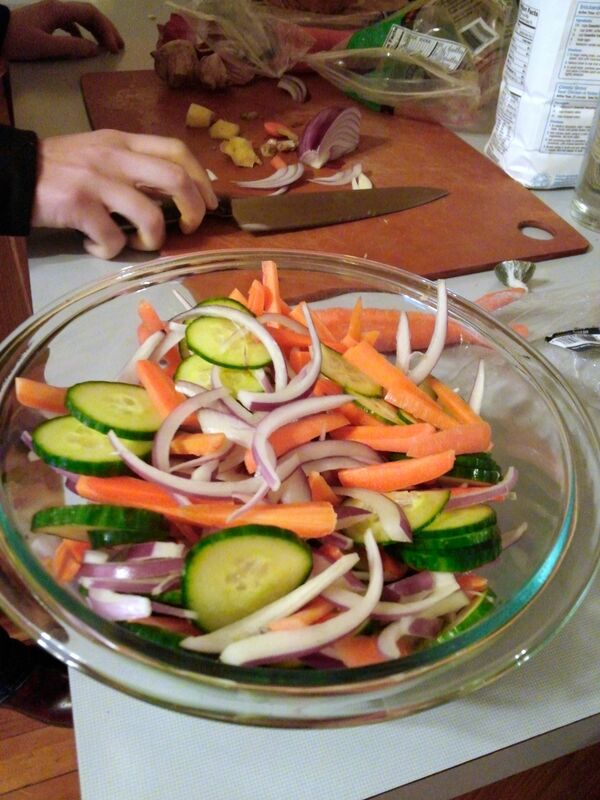 I added a bit more color with red pepper and carrot in this preparation of about 4 servings. I’ve learned that twice-cooked pork is traditionally made with pork belly (but I’ve not seen that in american restaurants). I decided to use inexpensive, lean chops instead. First, I boiled three whole pork chops in water with salt and pepper, cooled them (with ice cubes in the water), then thinly sliced them diagonally so that cuts are across the grain and so the slices can be wider than the thickness of the chop. To prepare the sauce: start with about a cup of stock (I made the stock with some granulated chicken-flavor instant bouillon and the water used to boil the pork), add minced fresh ginger and garlic (4 cloves), coarse ground black pepper, sugar or honey (1-2 T.), soy sauce (2-3 T.), oyster sauce (4 T.), rice vinegar (1-2 T.), a dry red wine (1 T.), black bean paste (1 T.), chili garlic sauce (1-3 T.), and a couple teaspoons of corn starch. 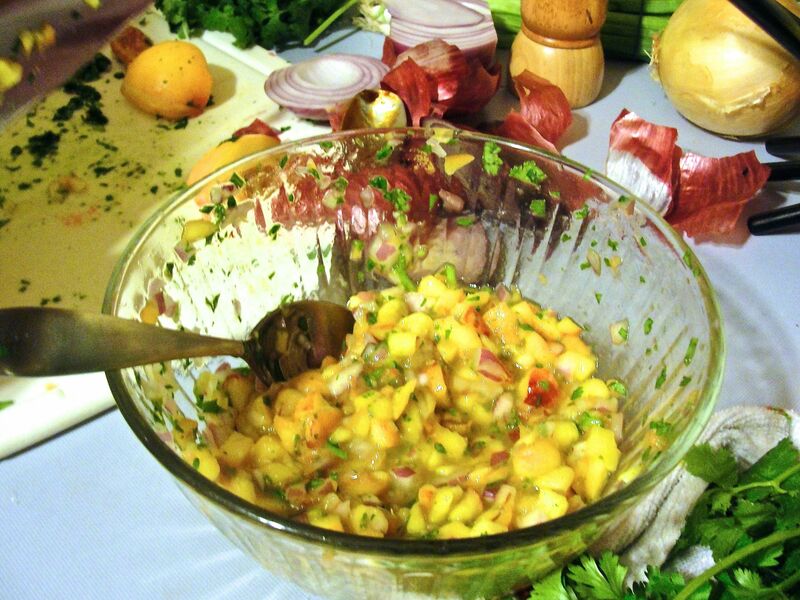 Be sure to taste-test the sauce for the right balance of sweet, sharp (vinegar), and spicy. 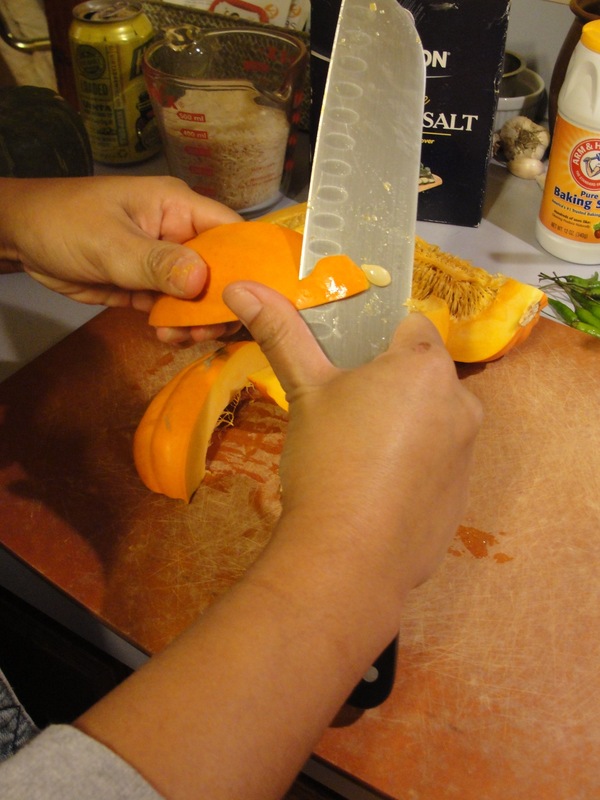 There’s plenty of salt in soy sauce and bean paste, so don’t add salt! This resulted in about 2 cups sauce before reduction, which worked well, since I like my pork saucy, like my … oh you know the joke. 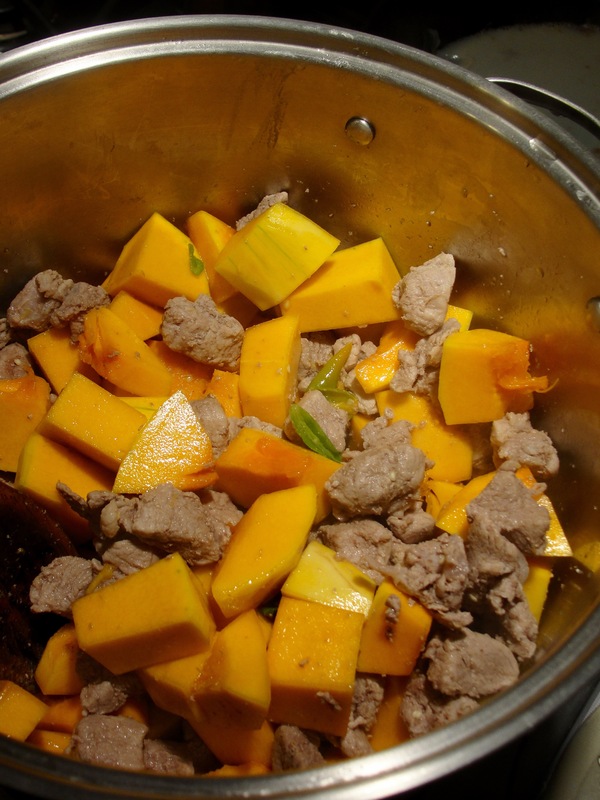 To fry: in canola oil, stir-fry the pork slices to brown edges, coat with some sauce, then remove. Next stir-fry the vegetables, occasionally adding sauce slowly (to coat and reduce): carrot, green and red bell pepper, scallions, then sliced black mushroom (fresh or reconstituted), and then chopped cabbage and scallion greens. 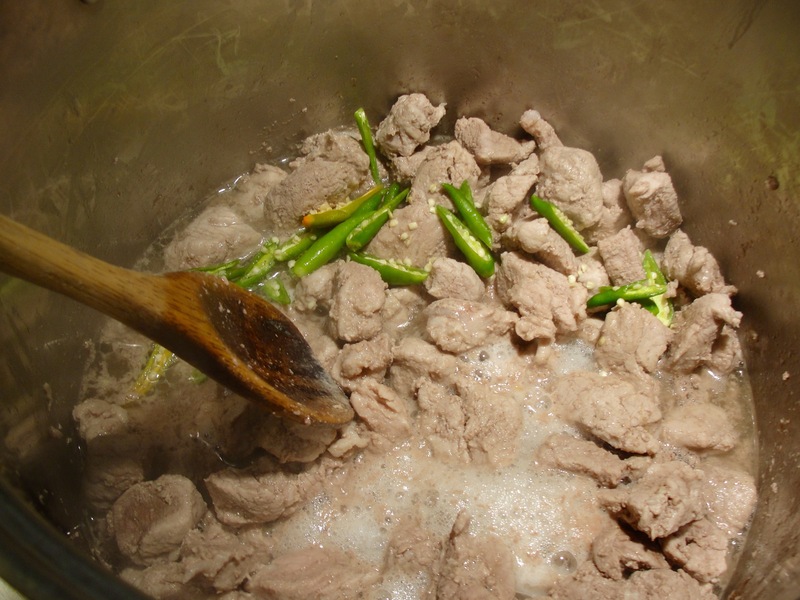 Return the pork to the pan, add remaining sauce and reduce to your liking. 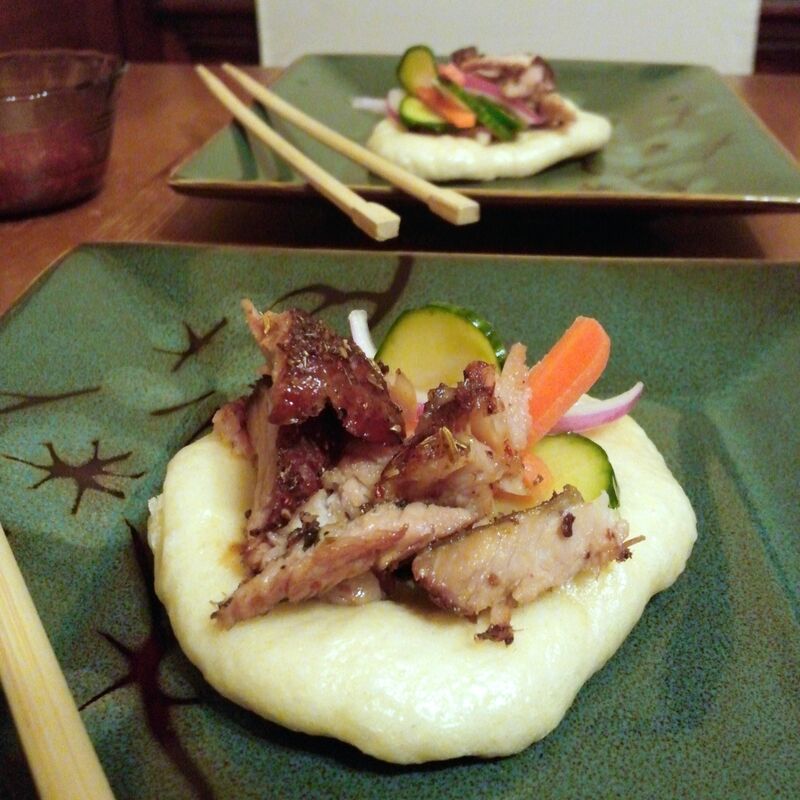 Serve with sticky rice and enjoy! – I really like this guy’s amateur video… he seems like a kindred spirit. 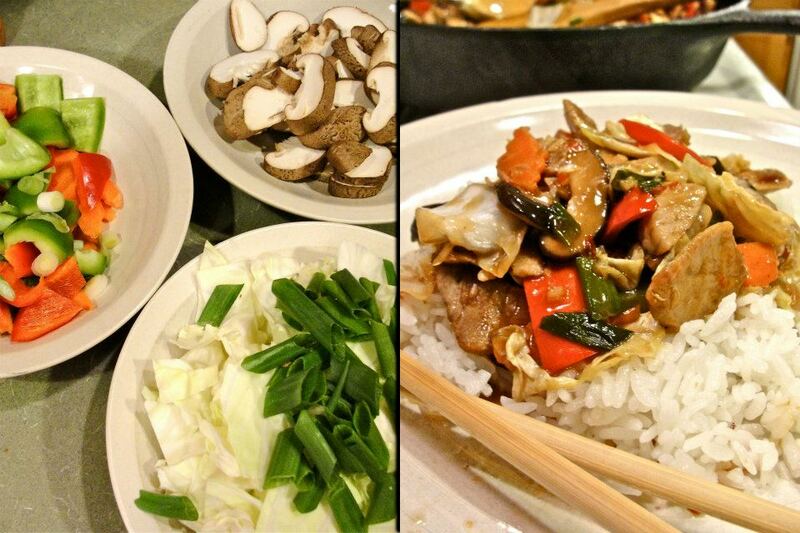 :-) He would have been fine if he’d just stir-fried the pork before putting in the vegetables that release moisture. 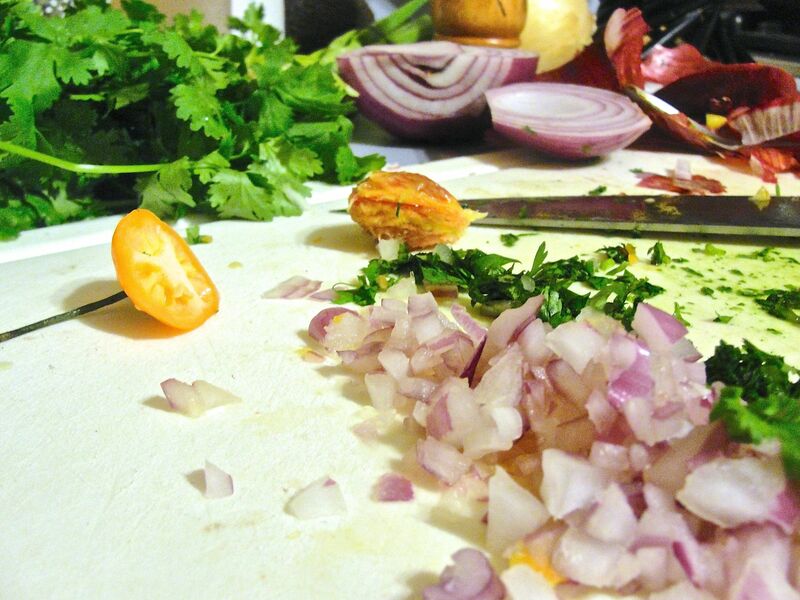 – This chef shows an interesting stir-fry technique and a minimal recipe. 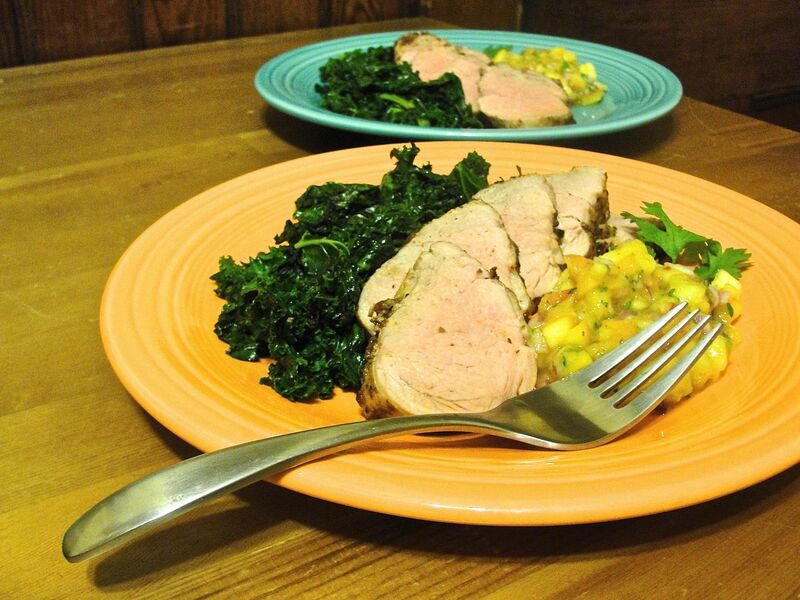 I’ve made this dish many times, most recently with pork shoulder roast ($1.99/lb.) and skipped the mushroom and substituted white onion for scallions, simply because I didn’t have them on hand. It always comes out great. I marinated this pork tendorloin in olive and sesame oils, red pepper flakes, and minced fresh garlic and ginger and cooked separately. 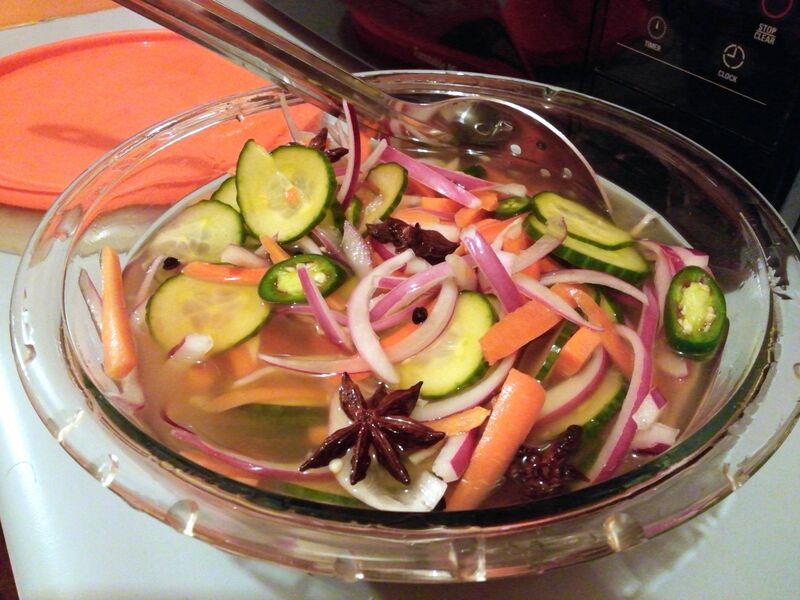 The wine sauce with vegetables was made similarly to that in the recipe below. 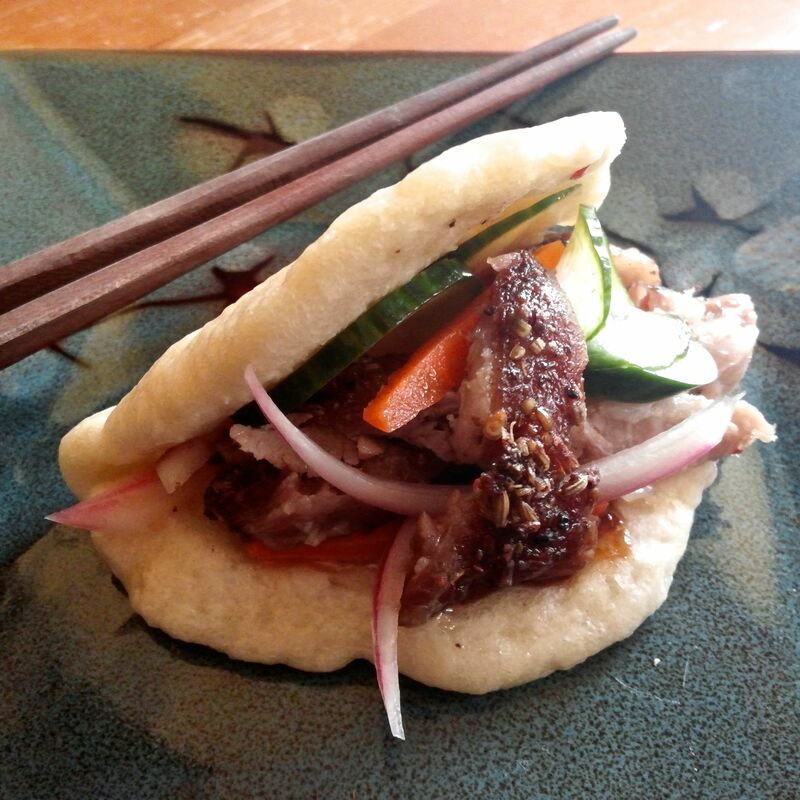 This was inspired by recipies on the television program Simply Ming. 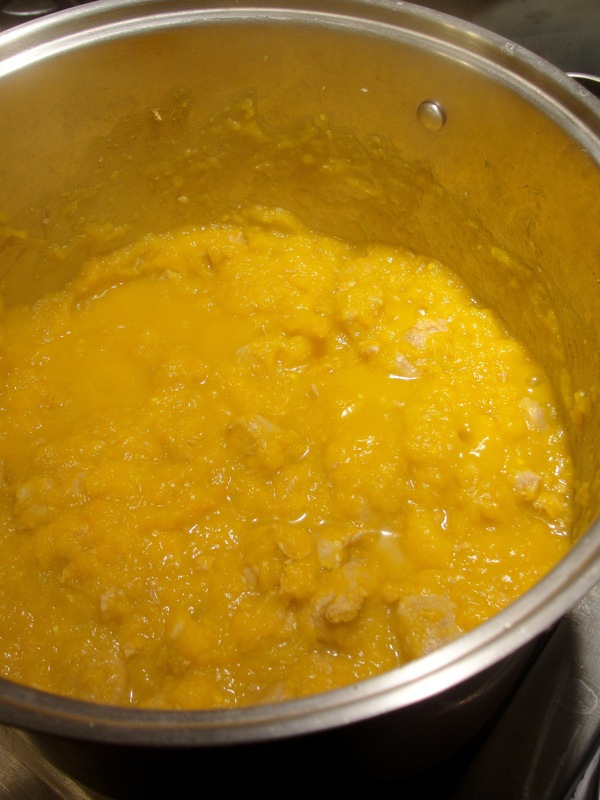 Personally, I found the combination of both the sweet simmer sauce and the sweet marmalade to be too sweet overall, so I’d use one or the other instead of both.